My job had me headed to Portland, Oregon and I found this to be the perfect opportunity to get out for a Washington elopement. Before this I have never visited Washington state! Recently I met Olivia (@augustmusings), the sweetest person ever, at a Wander Workshop 2017 and since she is from that area we thought this would be the prefect opportunity to get together and collaborate on a photo shoot in, yep you guessed it, the mountains. Tuesday morning I woke up before dawn so excited to photograph a Washington elopement that so many other photographers can only dream of. It was a misty morning in Vancouver Washington, and just down right stunning. As I sipped my 1st cup of coffee of the day I contemplated the mental checklist I had been going through for weeks. While admiring the two spectacular bridal bouquets from Bramble Floral of Portland Oregon, I was anxious it would rain, but knowing we’d make the best of it if it did. The drive to Silver Star mountain was an experience in itself. The road was pretty much what I would expect an off road course to look like. But fortunately we didn’t take the rental car and Olivia had access to a vehicle that could handle it. About half way up, Olivia decided she had enough of these road conditions and Levi (my boyfriend aka Prince Charming) came to the rescue, took one for the team, and made sure we all made it to the trailhead safely. From there we then had to hike 2 miles straight up the windy mountain carrying our gear, the spectacular bouquets I spoke of earlier, that I forgot to add were over 10 pounds each. As well as the star of the show, the bridal gown it’s self provided by A & bé of Portland, Oregon which I might add was another 10-15 pounds. Once we reached the mountain top, and and saw the expansive Washington landscape that would frame our models that day it was all worth it. Our models were fantastic, they did not even flinch when we realized there wasn’t a single tree for them to change behind. Luckily Olivia was prepared and brought a plastic tarp for Shannon (our female model) to stand on so we did not dirty the gown. As soon as Shannon and Ian changed the fog started to roll in, it was so dense it looked as if there was a cloud that we could touch hanging right over our heads. 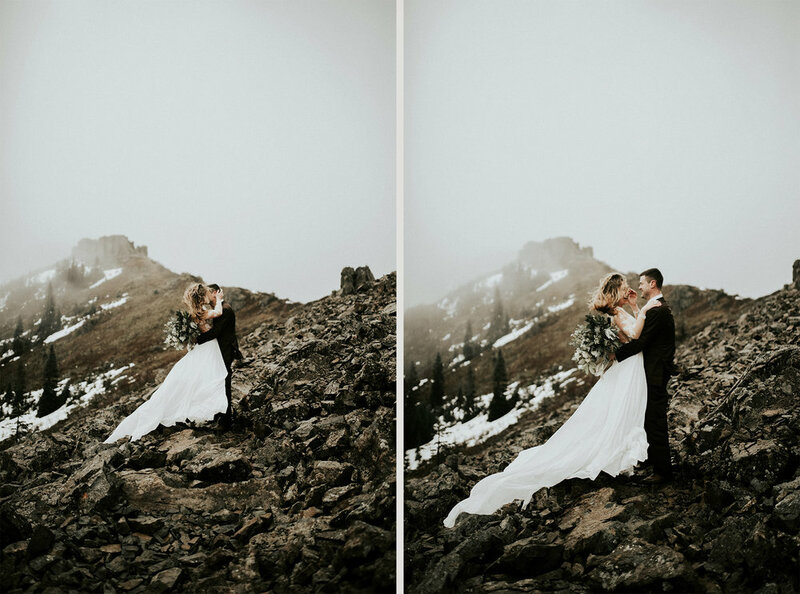 Immediately Olivia and I looked at each other with so much excitement because even though the mountains were disappearing, the fog gave us a completely different vibe for this Washington elopement. At that moment I truly experienced the PNW. Here are a few photos from our magical experience! I hope you enjoy looking at the photos as much as I enjoyed taking them. 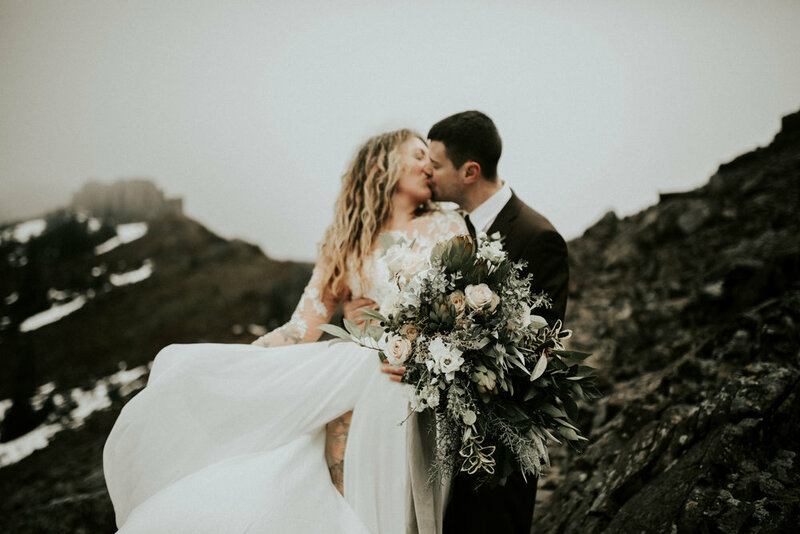 Make sure you go check out Bramble floral design @ http://www.bramblefloraldesign.com as well as A & bé bridal @ https://aandbebridalshop.com/portland/. 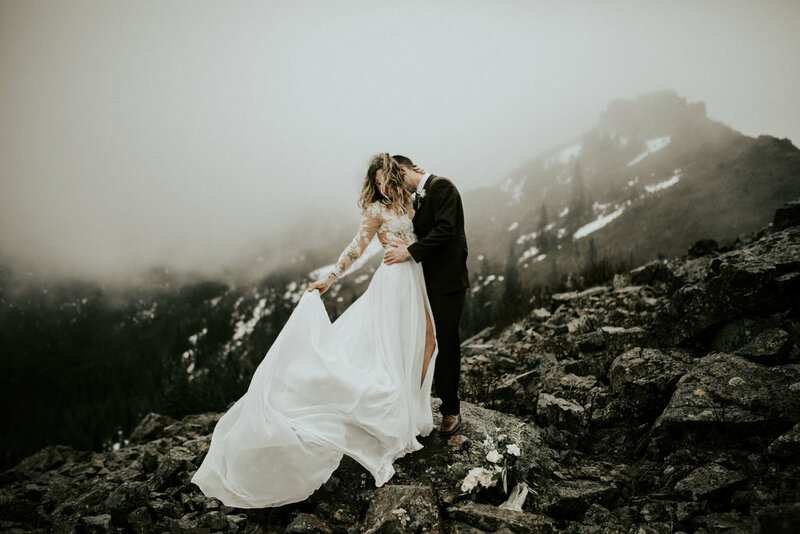 If you are interested in being as adventurous as this couple and considering eloping click here to inquire now! Cassandra Michelle Photography - Elopement Photographer - Get to know me!